Whether you own your home, are buying a home, or you are a business owner, you can rely on our trusted independently owned Indiana property inspection company. Our licensed inspectors are certified to perform thermal imaging inspections and use specially designed thermal imaging cameras to produce images called thermograms. These images show surface temperature differences which may indicate problems undetectable by conventional inspection methods. Thermal imaging measures surface temperatures by using infrared cameras. Our home inspection company utilizes thermal imaging cameras which detect light in the heat spectrum. 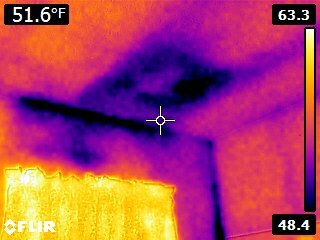 Images of temperature variations in the building ranging from hot-cold regions help us determine whether areas of the home need attention and/or repair. What Can You Do to Get Ready For a Thermal Imaging Inspection? Homeowners can take steps to ensure an accurate thermal imaging result. This could include moving furniture away from exterior walls and removing window treatments. You receive the most accurate thermal imaging scans when there is a large temperature difference (at least 20°F) with inside and outside air temperatures. In Indiana, thermographic energy scans are more effective, due to large differences between inside/outside temperatures, when conducted in the winter. There are certain times of the year, because of “thermal loading,” where it may be necessary for the homeowner, depending on weather conditions, to create or maintain a certain temperature difference, between indoor and outdoor temperatures, for a period of up to four hours before the thermal imaging scan. Accomplishing this can be achieved by running the air conditioner in cooling climates or the central heat in heating climates can do this. Ask AWP Home Inspections prior to the thermal imaging scan if this will be necessary.